Cultures around the world have been eating and drinking fermented foods and beverages for thousands of years: sauerkraut in Germany, kimchi in Korea and Kombucha in China to name a few. For some time, with the advances in technology and food preparation, these traditionally fermented foods were mostly lost. 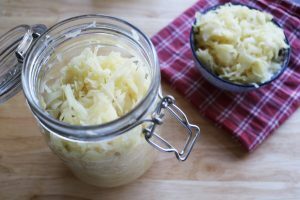 Fermented foods have been slowly replaced with easier and faster conventional ways: yeast-risen bread, white pasteurized vinegar, vinegar-based pickles and sauerkraut, soy sauce, pasteurized milk; the list goes on. More recently, however, fermented foods are making a comeback, and we’re happy to say it’s easy to find locally made kombucha and farm fermented sauerkraut, or, would you believe it: sourdough pasta! Fermented foods go through the process of lacto-fermentation using microorganisms, such as bacteria or yeast, to feed on carbohydrates and sugars in food that create lactic acid. This lactic acid is beneficial under anaerobic conditions (without oxygen) to preserve food, create enzymes and various strains of probiotics. This process is used to produce wine, bread, cheese, and beer. Not only does fermentation make all these delicious delicacies, but it also plays a role in improved digestion and increasing the bio-availability of nutrients in food. Fermented foods include: yogurt, sauerkraut, sourdough, miso, kimchi, natto, tempeh, kombucha, and kefir. 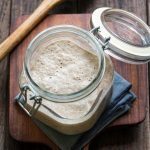 Some contain live probiotics that help with digestion and others have already completed the fermentation process to help break down anti-nutrients before they are heated or cooked. Through fermentation, anti-nutrients (also known as phytates or phytic acid) in food bind to minerals so they aren’t able to be absorbed in your gut. We have fermentation to thank for that, though soaking and sprouting can also reduce the anti-nutrient content, and therefore, make them easier to digest. Probiotics: Fermented foods/drinks like kombucha or kefir contain live probiotics that contain beneficial bacteria for the gut to aid digestion. Fermentation has been shown to help treat symptoms like Irritable Bowel Syndrome (commonly known as IBS), help reduce abdominal pain, bloating, and constipation. Absorption: Fermentation enables better absorption of nutrients in the foods we eat, and enzymes in fermented foods and drinks enable those nutrients to be properly absorbed in our gut. 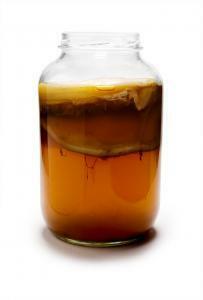 Preservation: Thousands of years ago fermenting was the only way of preserving food for long periods of time. Fermenting your own pickles, sauerkraut, carrots and other garden foods allows you to store these foods while keeping their nutrients and preventing waste. Thankfully, fermented foods can easily be found at your local grocery store and at all natural food stores. For those of you low on time, you can find fizzy fermented kombucha’s or delicious sourdough breads and pastas to tuck into your grocery carts as you make plans for a family dinner. Or if you’re feeling inspired, you can try our own hand at a simple sauerkraut recipe, or find a kombucha scoby from a friend for a probiotic-rich, refreshing drink. Either way, if you haven’t already, consider welcoming fermented foods into your healthful kitchen.